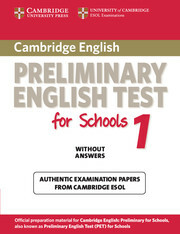  Accompanies a Student's Book containing specially updated KET practice tests from University of Cambridge ESOL Examinations providing the most authentic exam preparation available. Contains recorded material from KET examinations. Familiarises students thoroughly with the updated content and format of the Listening paper (Paper 2).